>> EXTRA LOW / OFFER Price - ONLY for 10 days for the Easter season 2019 - until 22 of April. 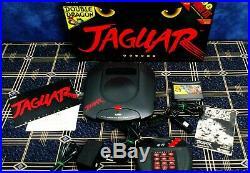 ATARI JAGUAR''DOUBLE DRAGON / POWER KIT'' EDITION. 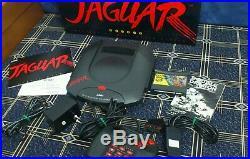 > ATARI JAGUAR console - PAL (EU) - NEW condition - HARDLY USED but to TEST its working condition. + BOX - QUITE GOOD condition , although there is. Tape at the back side see carefully photo 4. 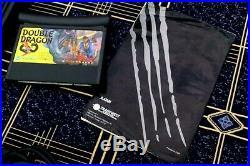 + INNER CARTON CASE / INSERT - VERY GOOD condition. + RGB / Scart TV CABLE - NOT an RF TV cable => meaning : HIGH QUALITY PICTURE & SOUND to ALL the TVs : PAL / NTSC , CRT , PLASMA , LCD , LED... + DOUBLE DRAGON Game cartridge + MANUAL. == The CONSOLE and GAME were TESTED and WORK EXCELLENT. 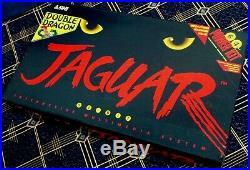 The item "ATARI JAGUAR Console''DOUBLE DRAGON'' EDITION NEW + SCART EXTRA ULTRA RARE" is in sale since Saturday, April 13, 2019. This item is in the category "Video Games & Consoles\Video Game Consoles". The seller is "evafrapa" and is located in MELISOHORI. This item can be shipped to North, South, or Latin America, all countries in Europe, Australia.